Amazingly life-life animal sculptures were the trademark of, the now closed, Townsend Ceramic & Glass Inc. Starting out in 1964 as Alaska Arts, until the company closed in December 2004, artist Ann Townsend worked in several different art fields. Ann Townsend was born in an Alaskan fishing village of Norwegian parents. She credits her father with teaching her that anything was possible. This helped Ann's determination to create and market art. Her first commercial works were a hand-painted cup and saucer sets of fine china. She later went on to creating Alaskan jewelry, as well as designing and painting men's ties. From this early start, Ann later became well-known as an Alaskan artist of landscapes and portraits. 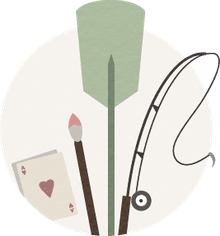 After their three sons were grown, the Townsend family moved to Florida, where Ann obtained her Bachelor of Fine Arts degree from Florida Atlantic University. At this time Townsend Ceramics & Glass Inc was founded by the family -- including support from her husband and two of their three sons. Townsend's ceramic animal figurines can range in size from several inches to as large as 36 inches. Son Kelly Townsend recalls when his mother created the large sculpture made of a Florida Panther. The panther was brought to his mother's studio for her to measure, study and sculpt. The panther was about 11 months old at the time and he remembers the handlers giving the animal raw meat every once in a while to keep him under control. His mother worked away, as about ten people stood around watching both her and the animal! 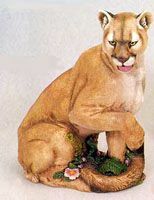 The Florida Panther sculpture is 29" tall and sold for $500. The Polar Bear shown in the images above was manufactured as a Townsend Ceramics piece but began life as one of Ann's early pieces in Alaska. The bear is 12 1/2" long, 6 1/2" wide. After making the initial sculpture, a mold was made to create the individual pieces. All of the ceramic pieces were made entirely in the USA. Larger view of Townsend mark. Townsend Ceramics & Glass Inc closed their doors on December 31, 2004, but the sculptures can still be found in the secondary markets. A few remaining pieces are still available, contact Kelly Townsend for more information.